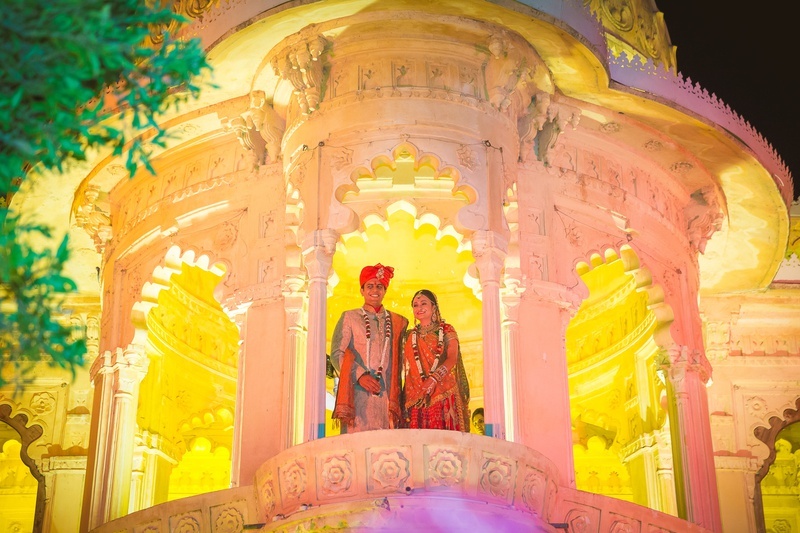 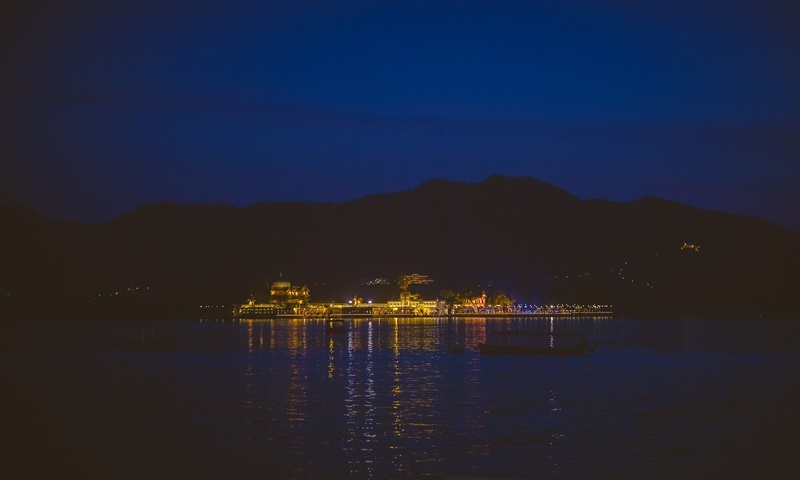 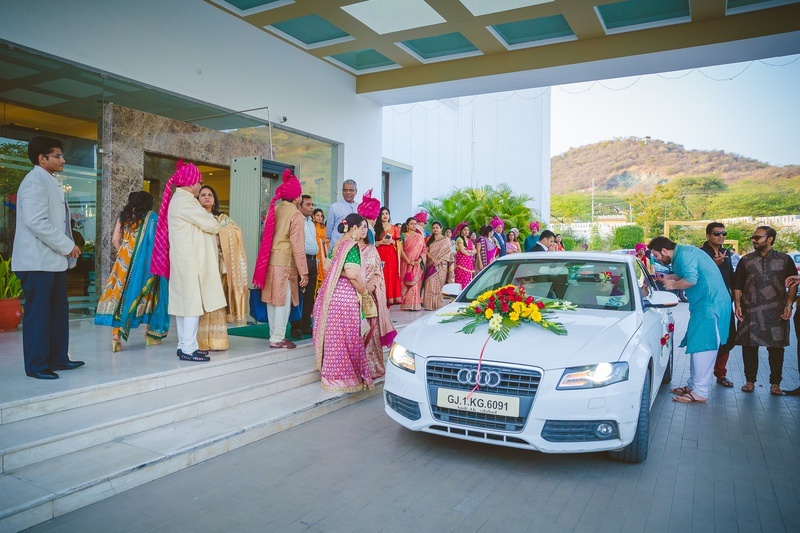 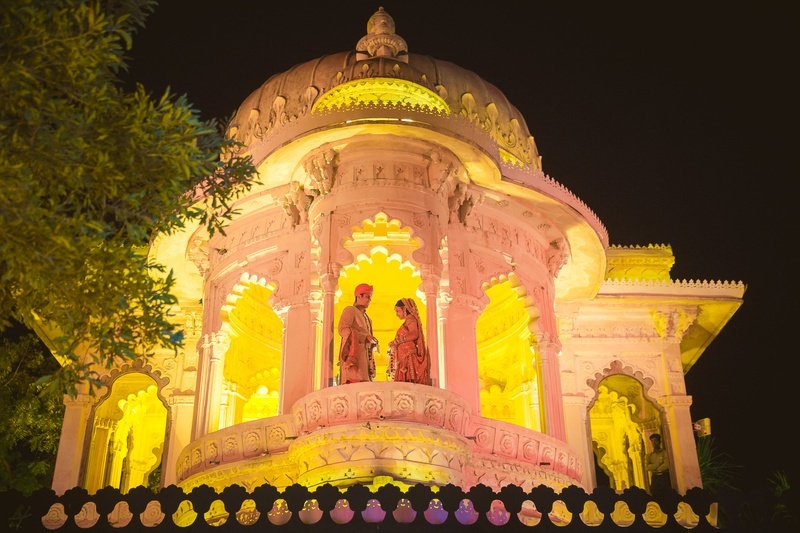 The stately space at Jagmandir, Udaipur held the union of Ekta and Sahil. 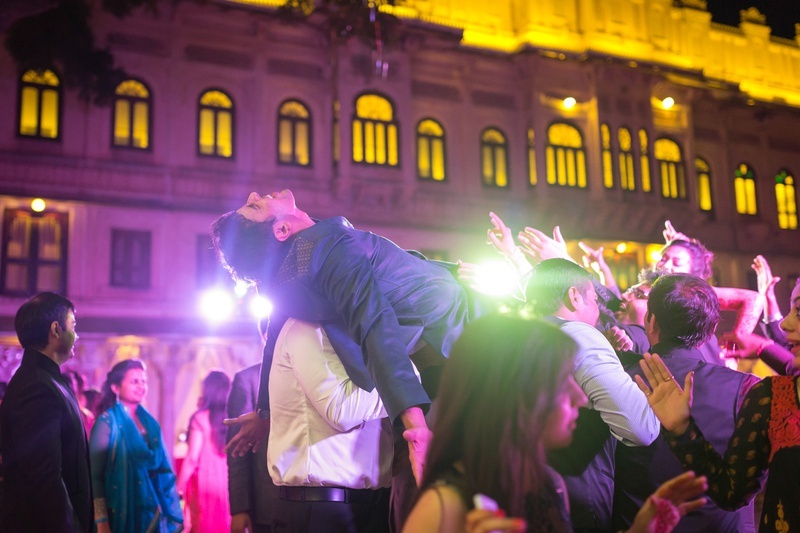 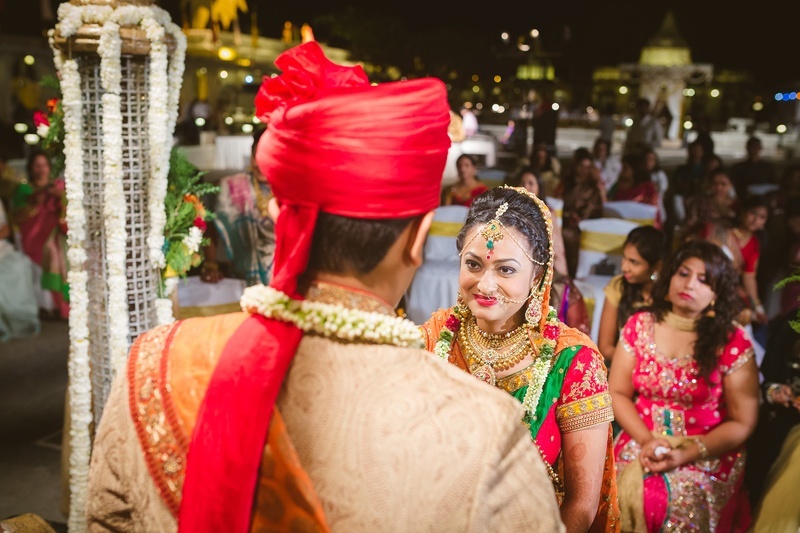 The heritage structures and grand ambience of the wedding venue filled the air with a pure feel of royalty making their wedding an affair to be remembered forever. 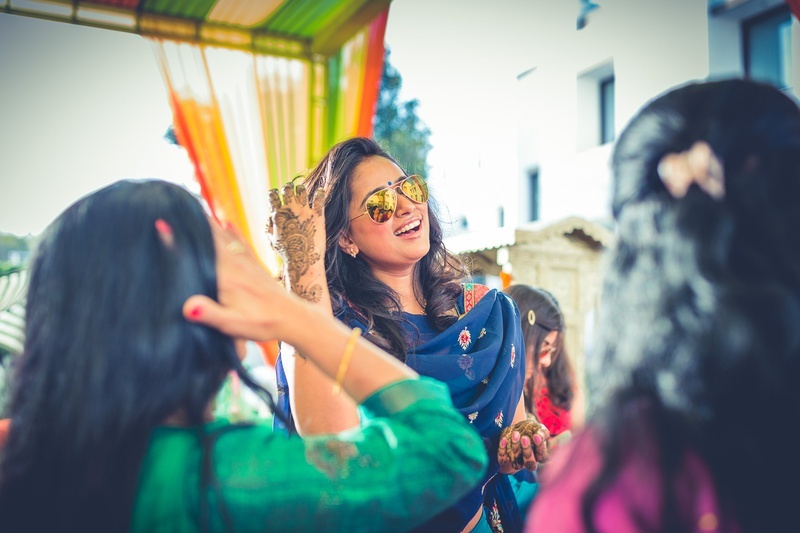 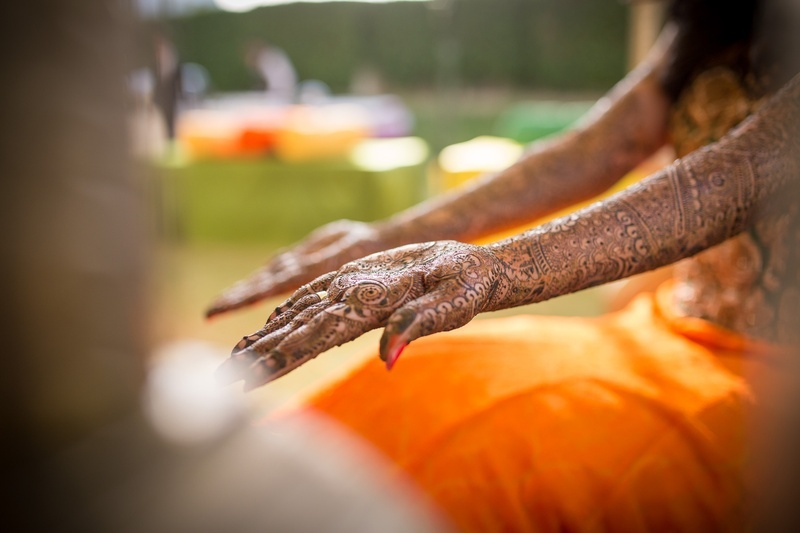 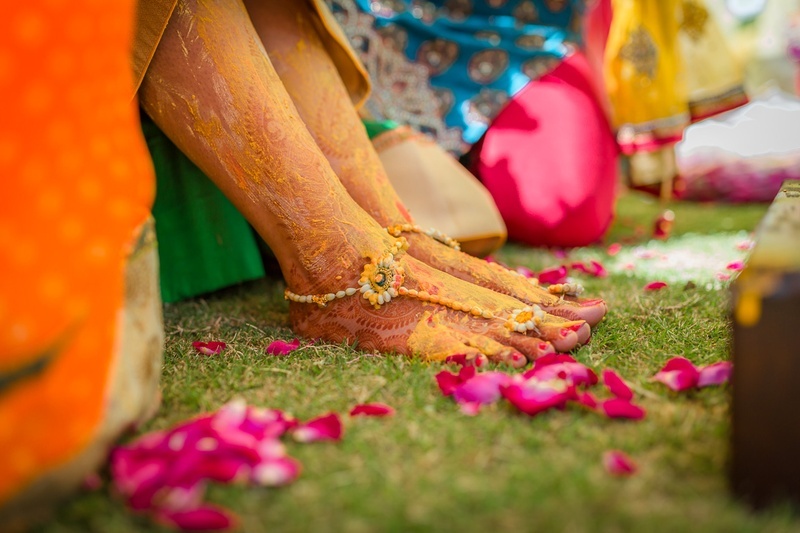 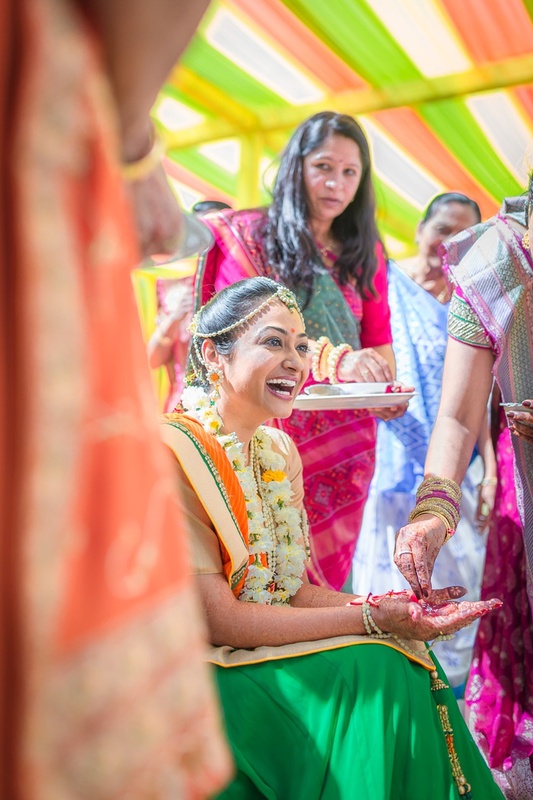 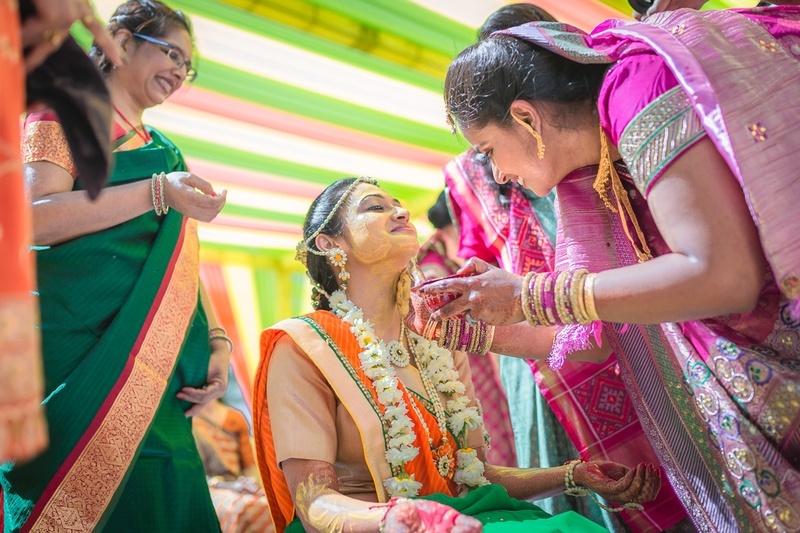 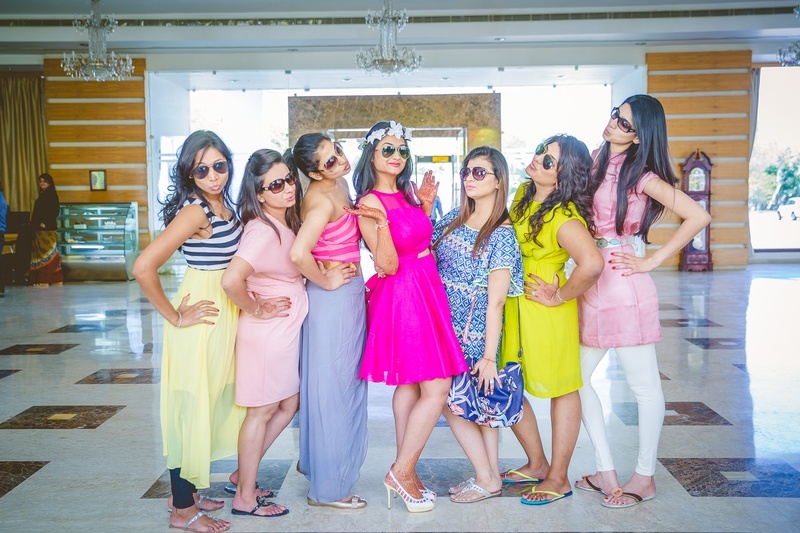 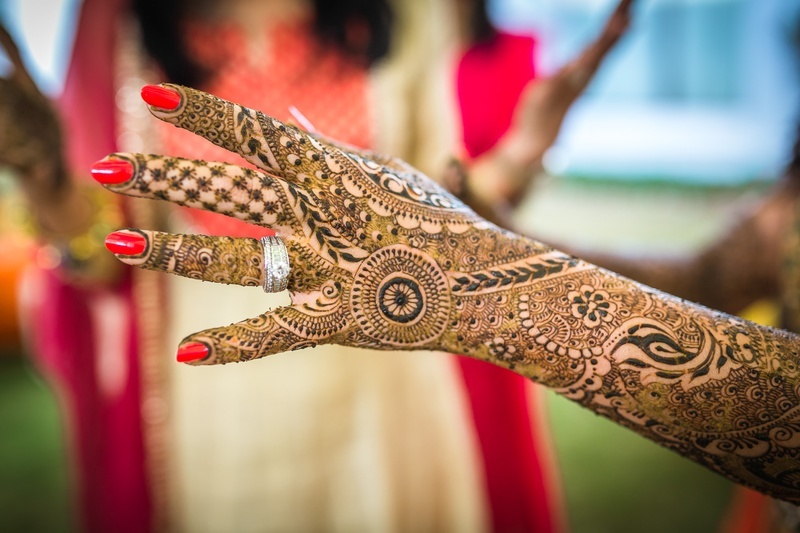 Celebrations commenced with the outdoor day-time mehendi and haldi ceremonies held under green, pink and white hued cabana. 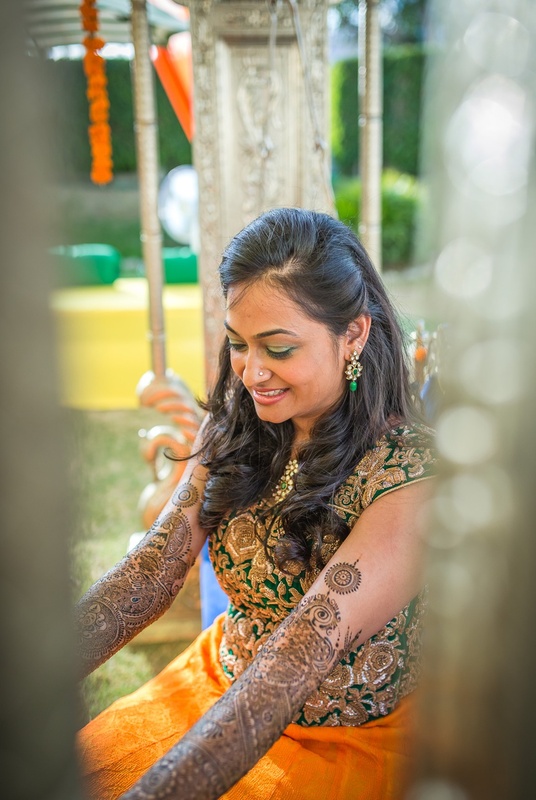 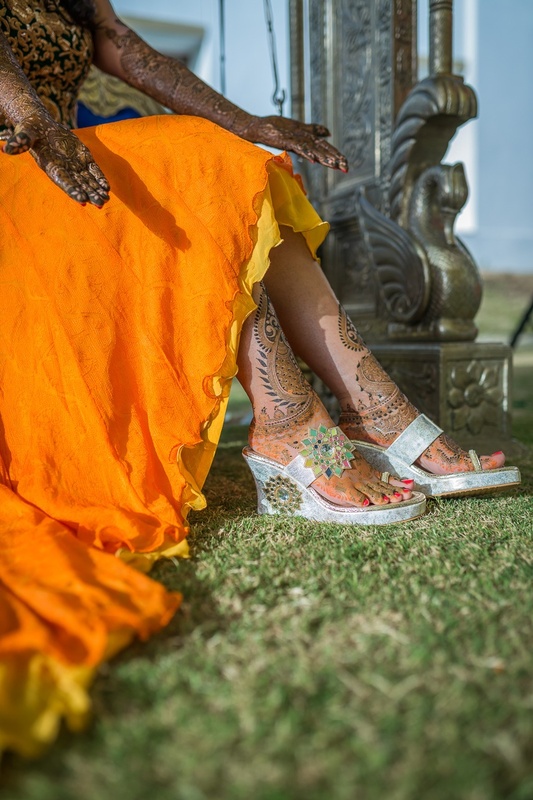 For the mehendi Ekta donned a bright amber skirt with an emerald green zardozi embroidered top and looked absolutely gorgeous. 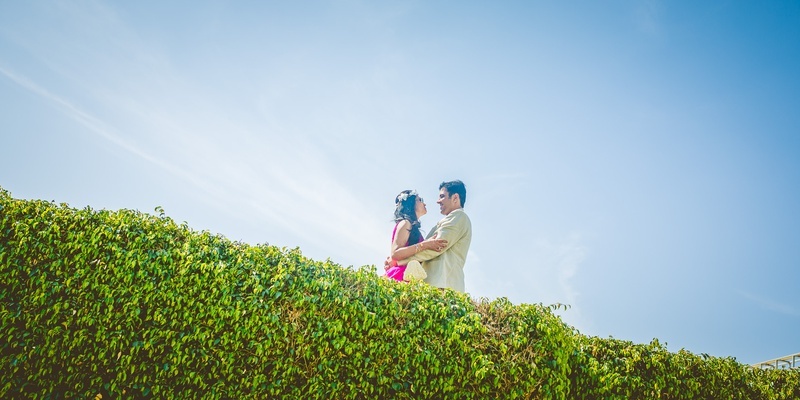 Her simple half-pulled back hairstyle brought her delicate earrings into perfect view. 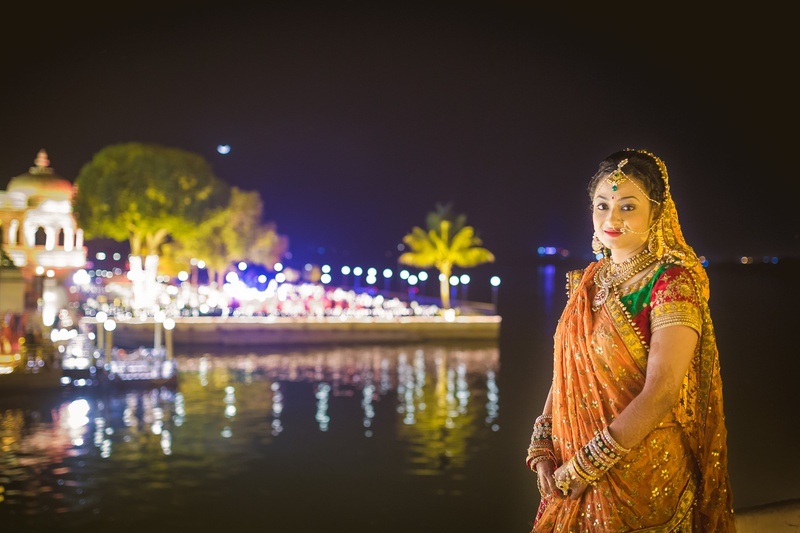 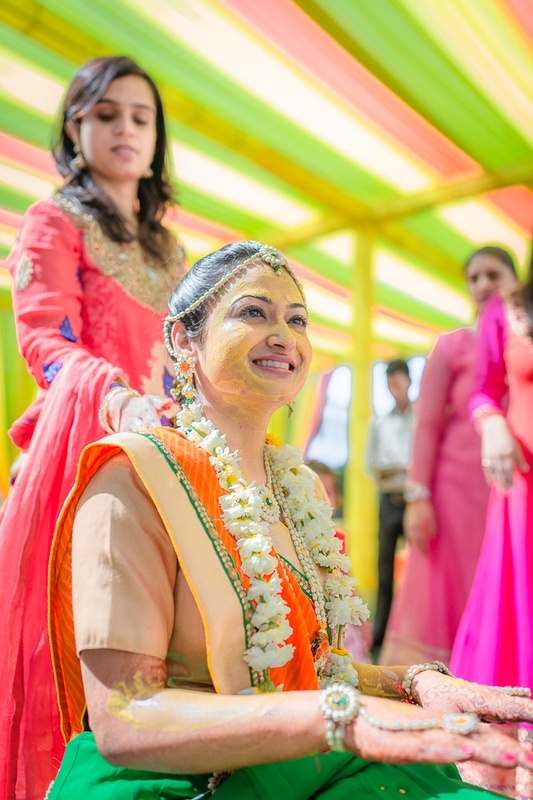 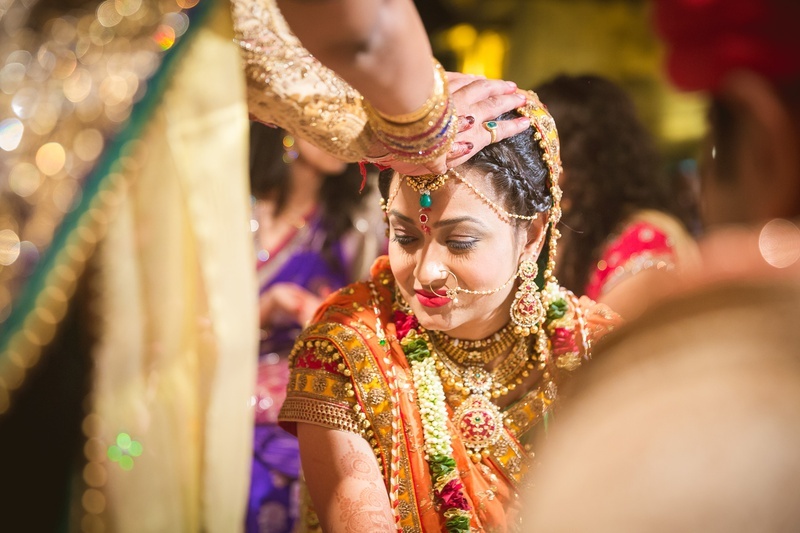 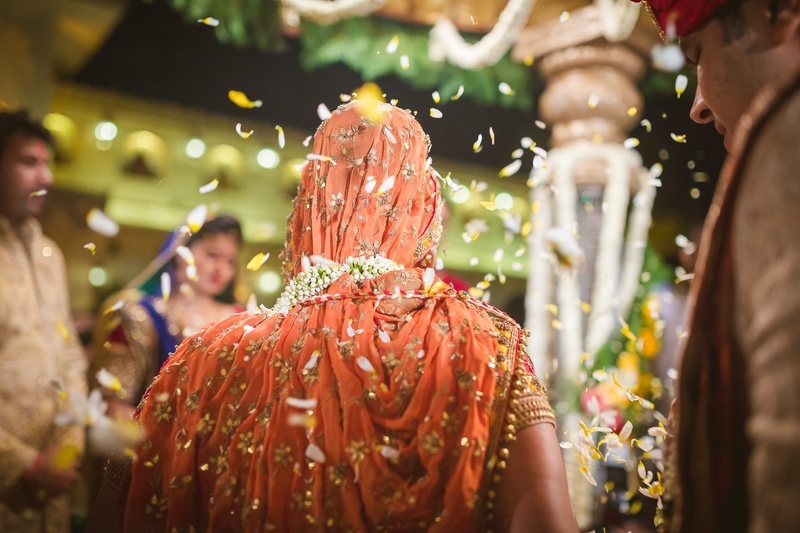 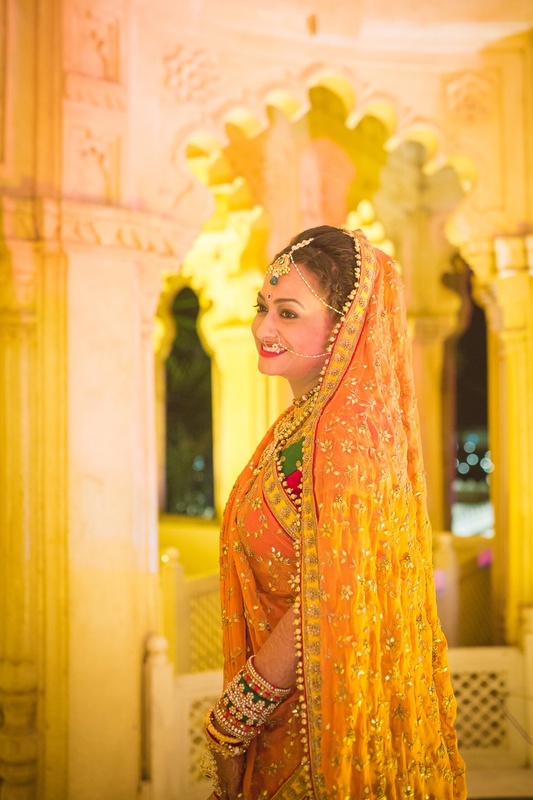 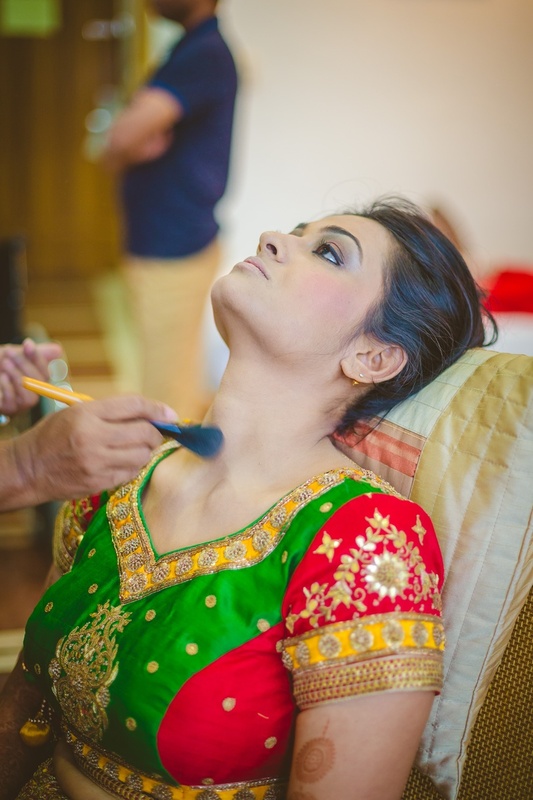 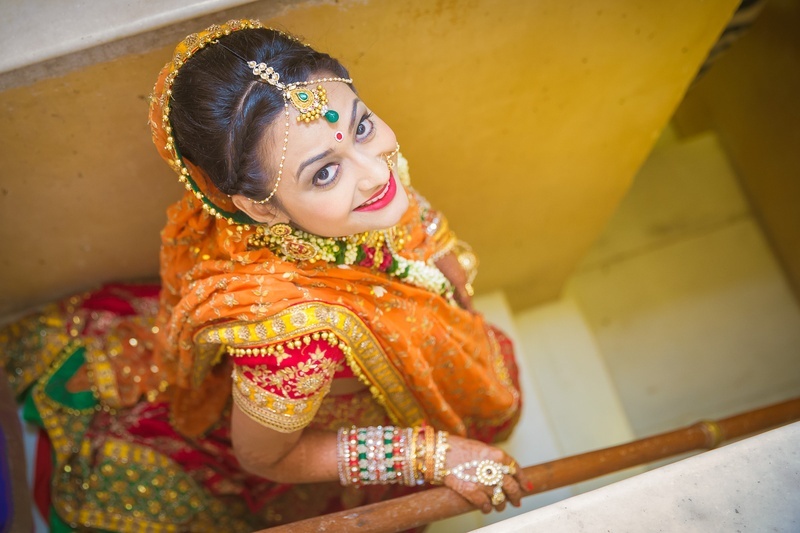 The stunning bride opted to wear an orange and green leheriya outfit with delicate fresh flower jewellery that perfectly complimented her earthy look. 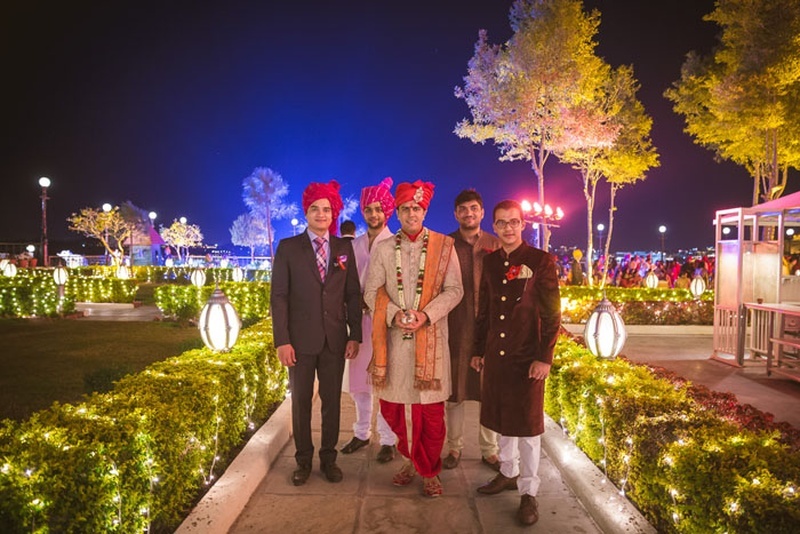 Next came, the splendid wedding ceremony! 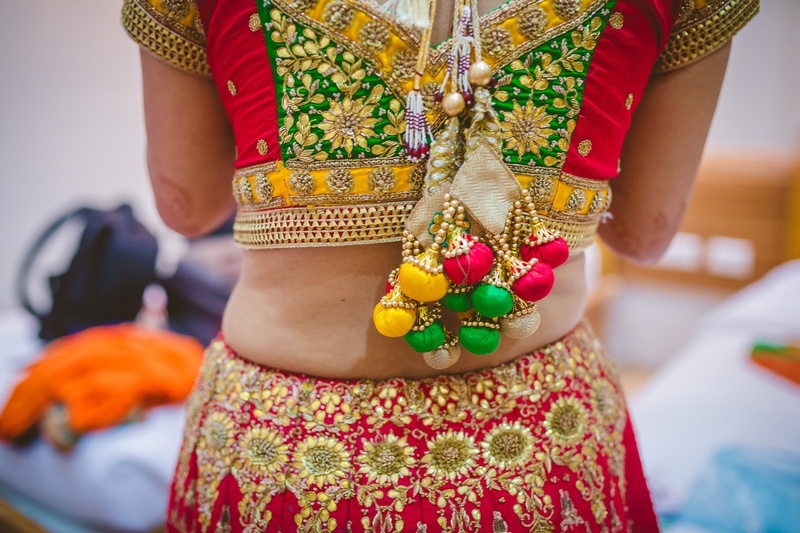 Dressed in a designer mix-matched green, red and orange gota patti lehenga. 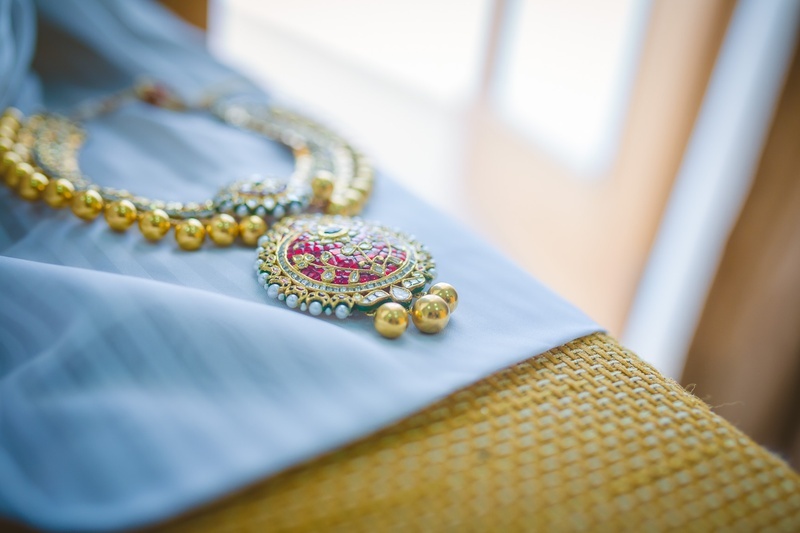 Her heirloom jewellery studded with gemstones, diamonds and large gold bead drops left us completely mesmerized. 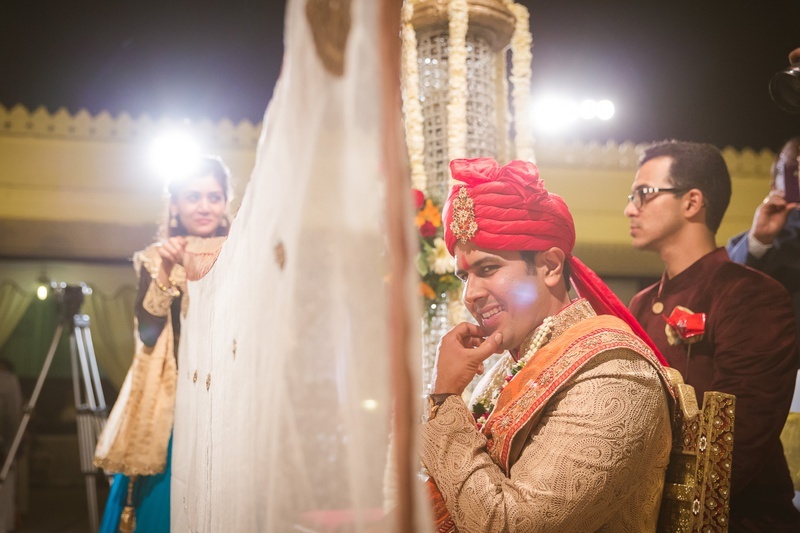 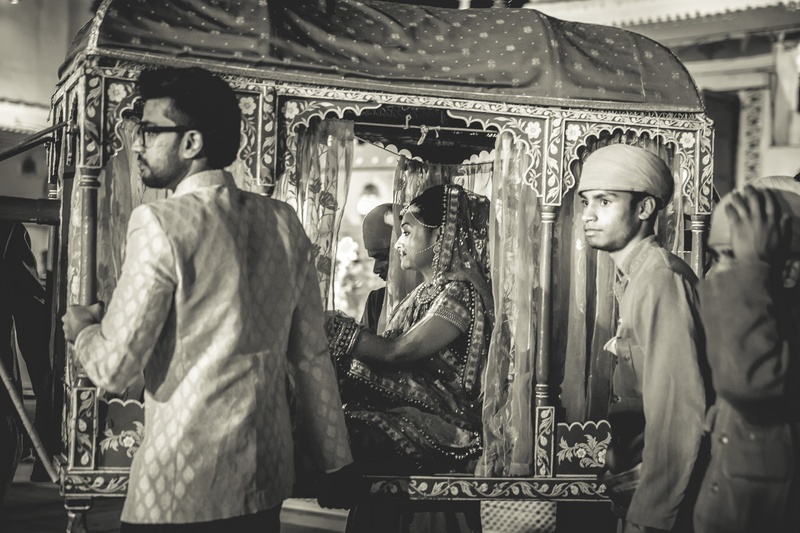 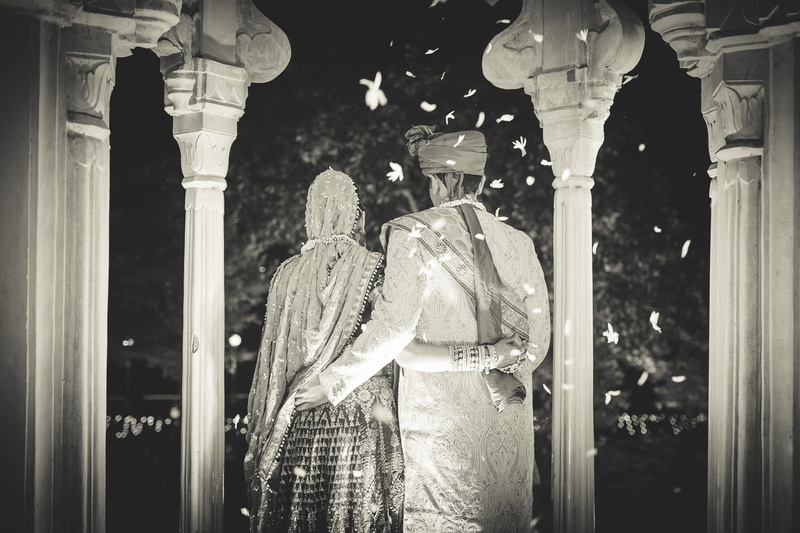 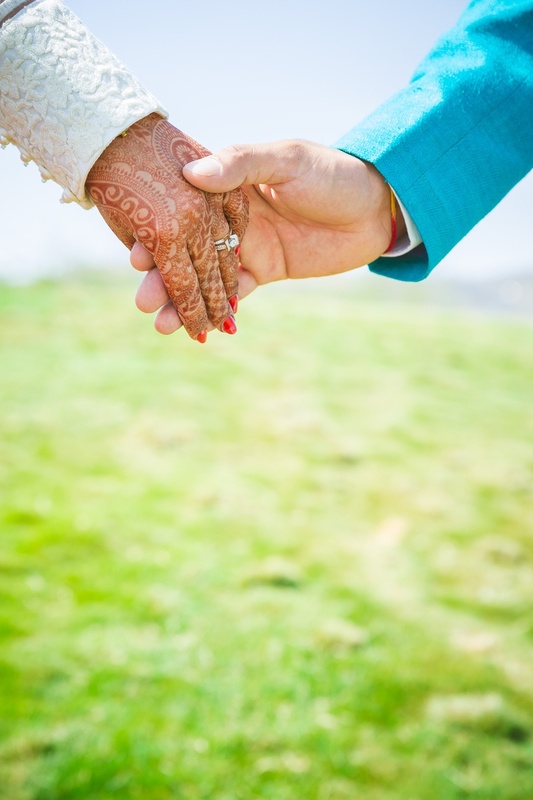 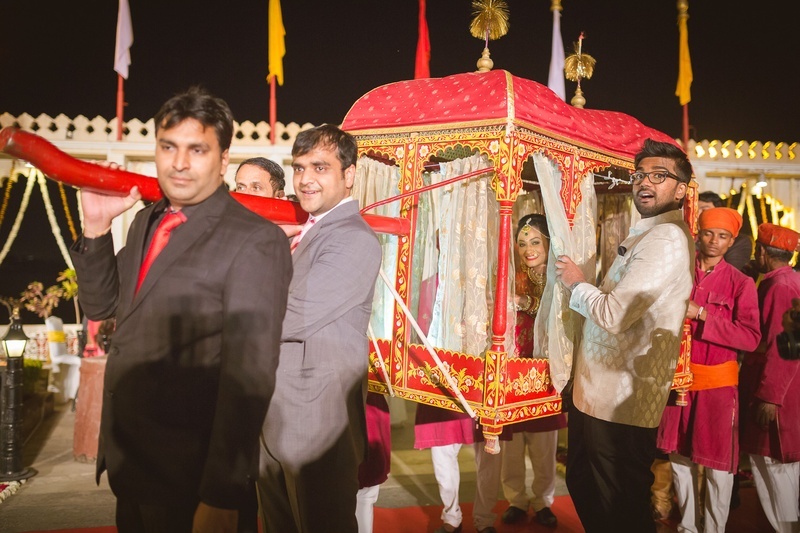 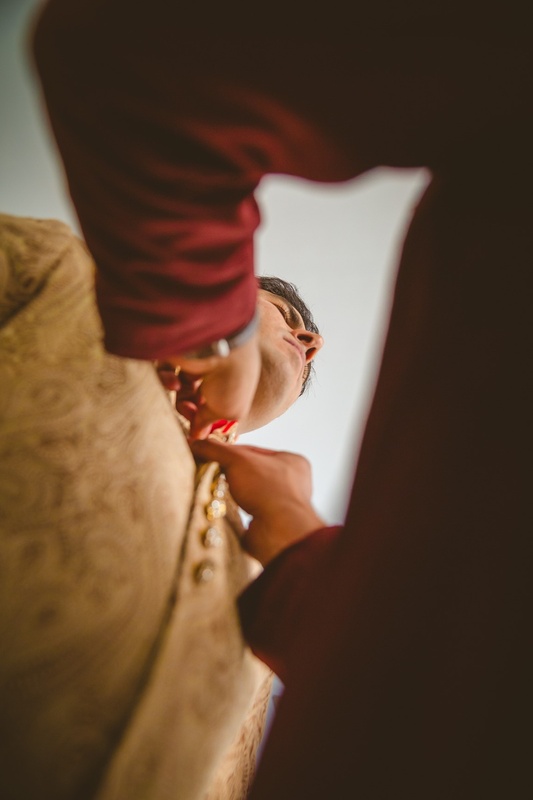 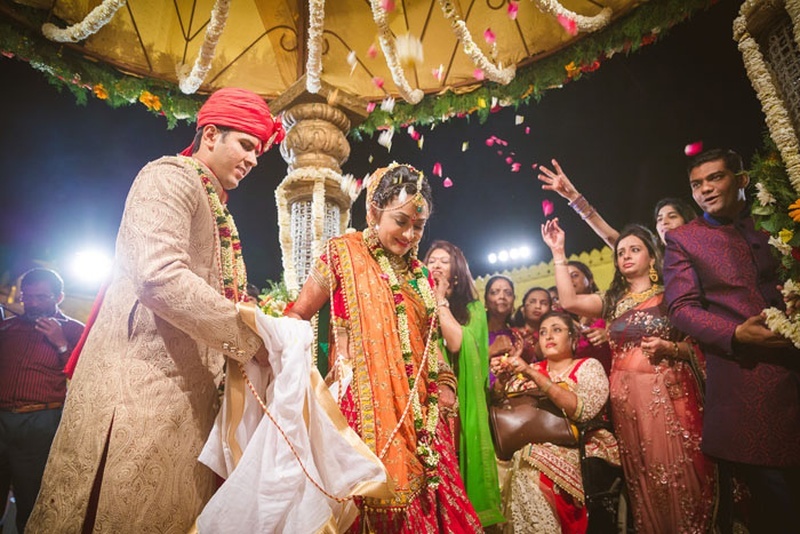 Sahil kept step with his beautiful bride in his off-white ethnically textured sherwani and red dhoti. 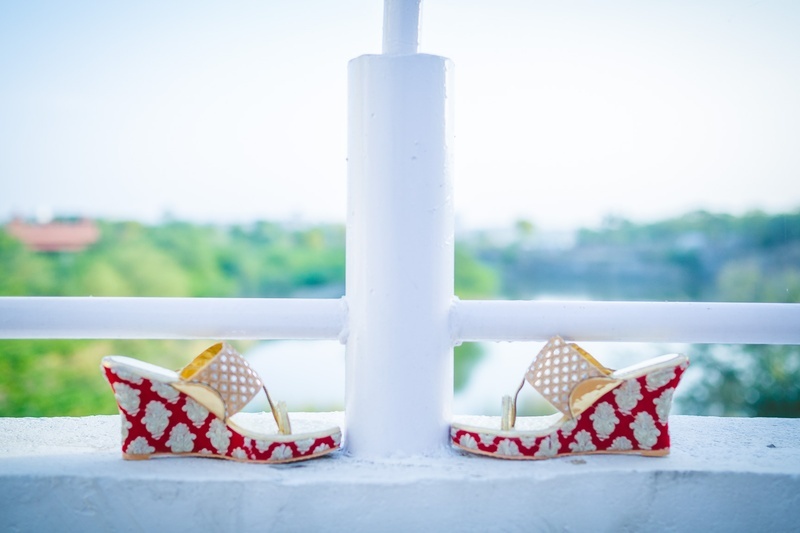 His never-seen-before embroidered red jooti’s were the most fashion-savy groom footwear we’ve seen, hands down! 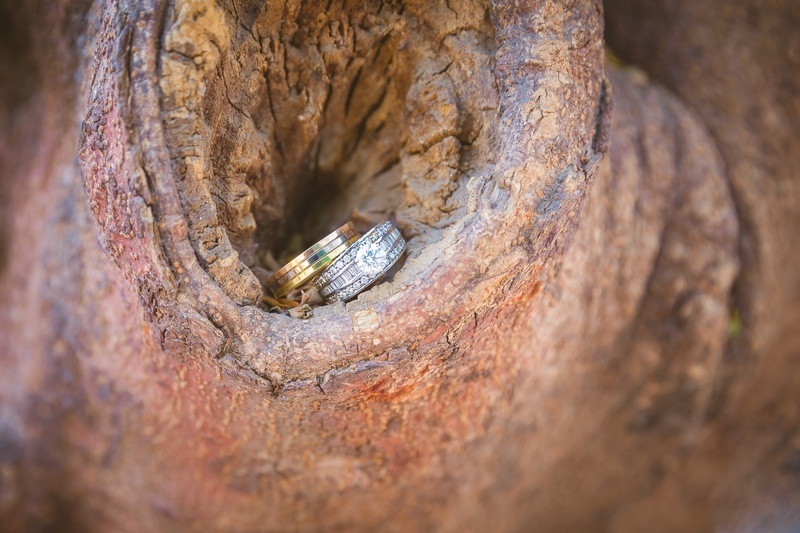 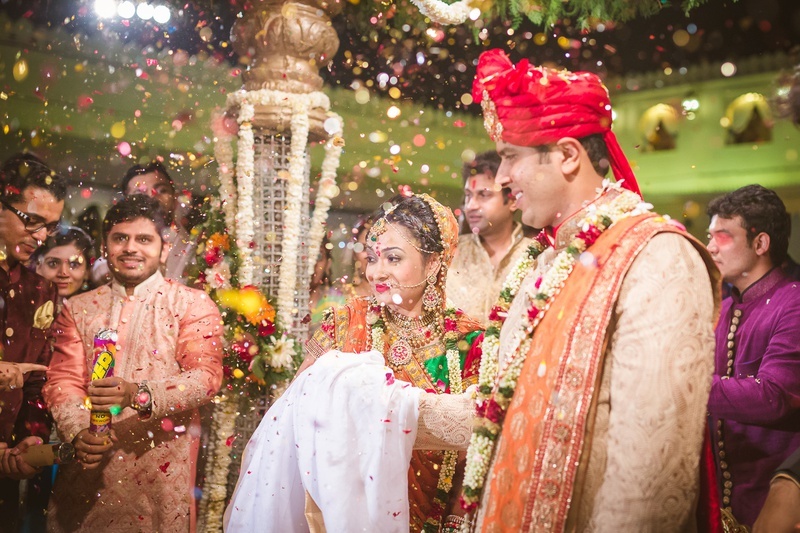 It was a union was filled with color, style and tradition in every pre-wedding ceremony and the traditional marriage as well. 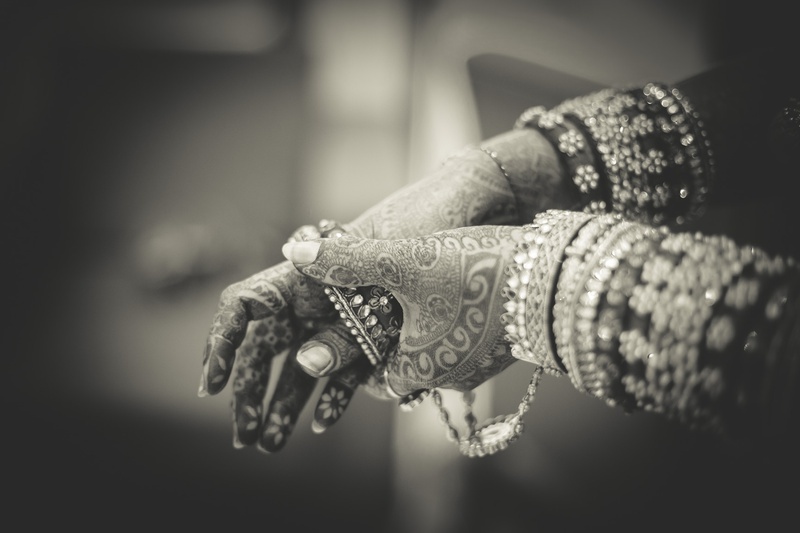 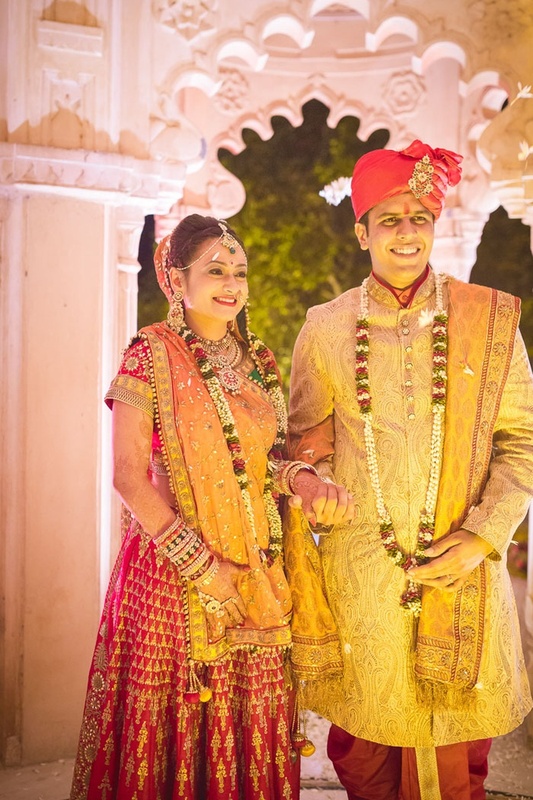 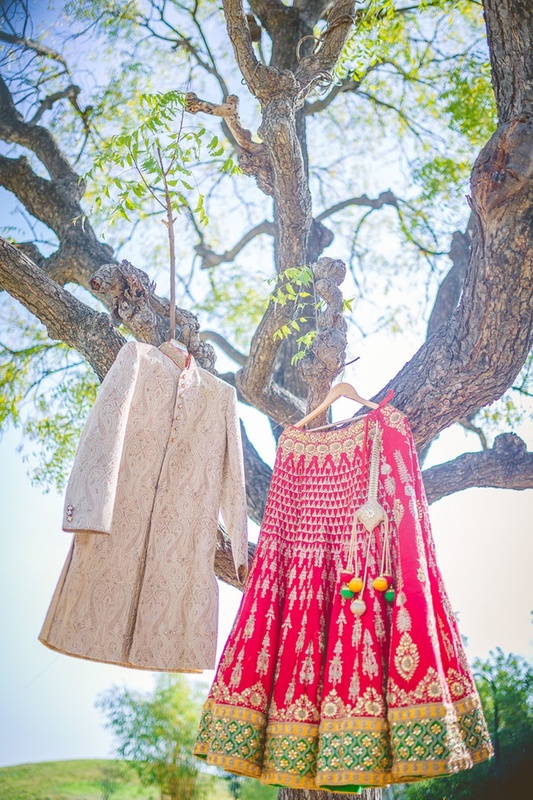 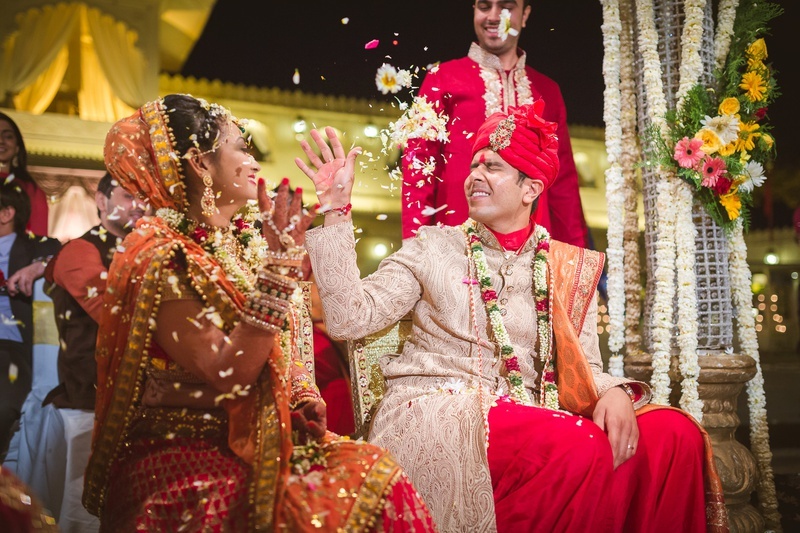 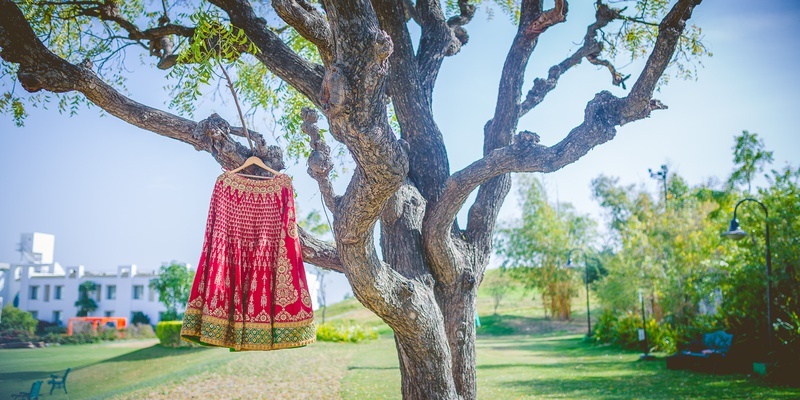 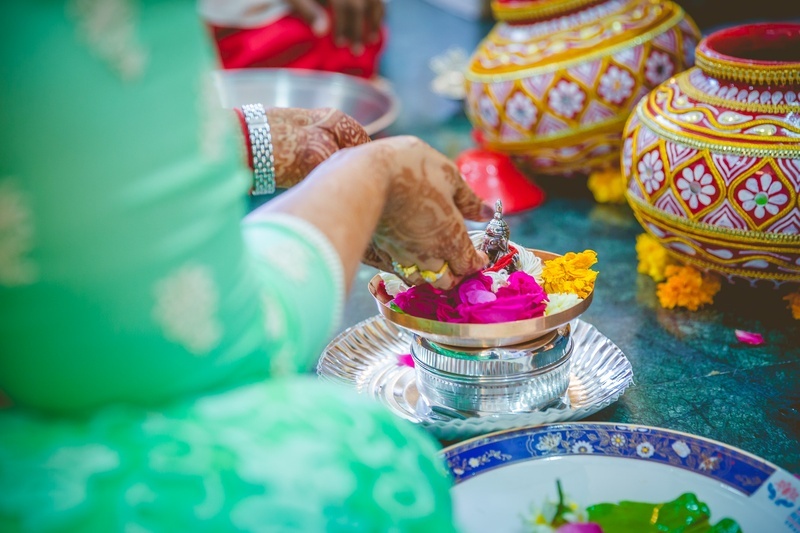 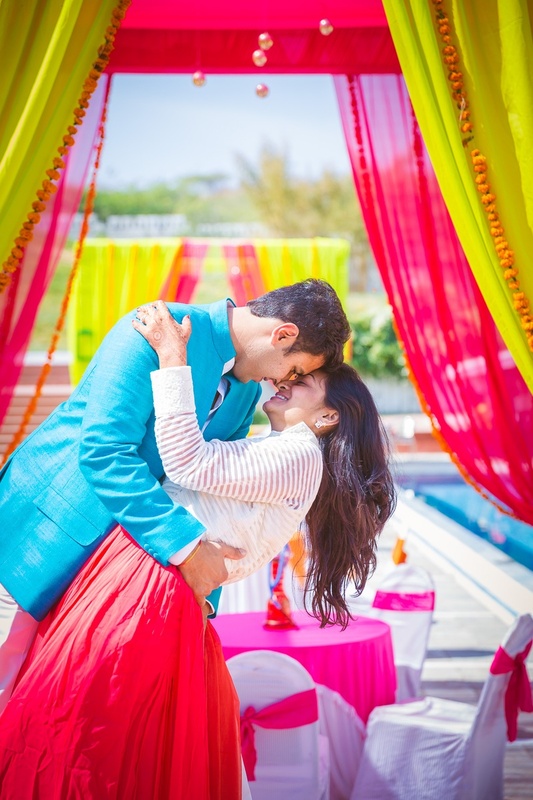 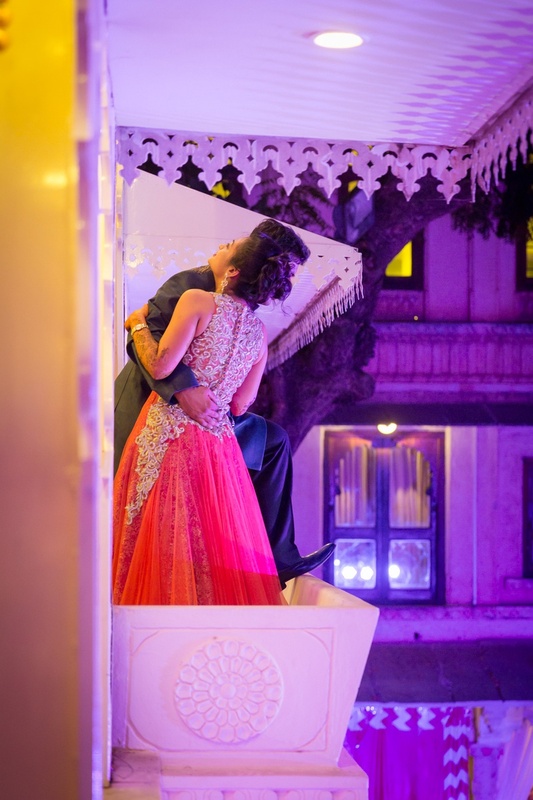 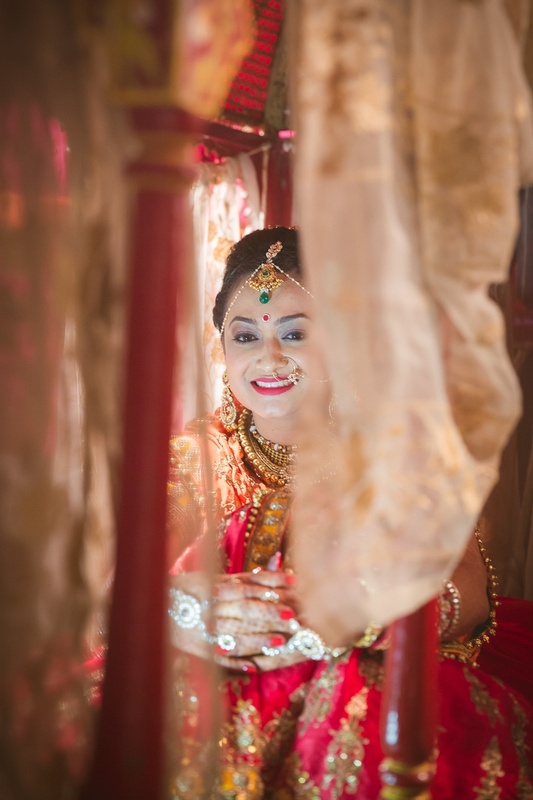 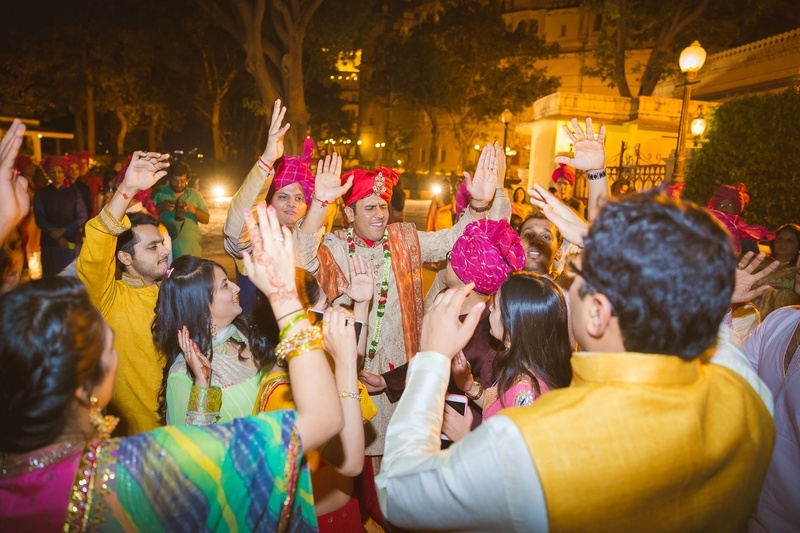 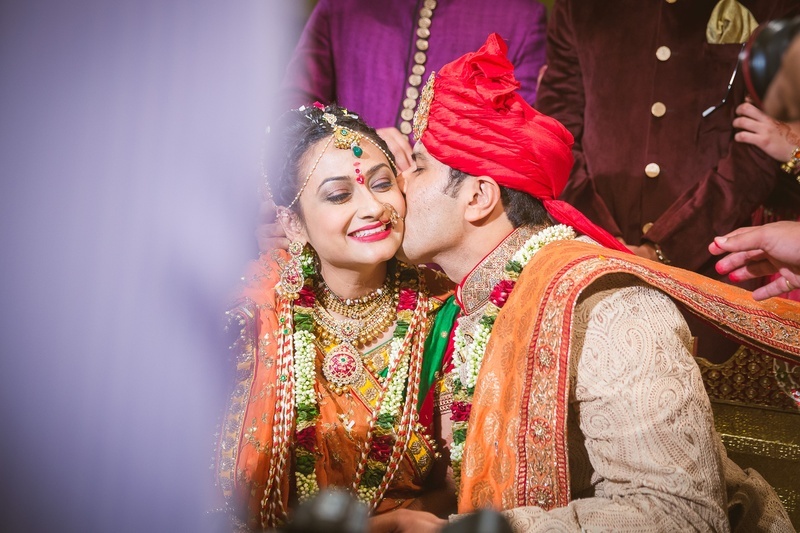 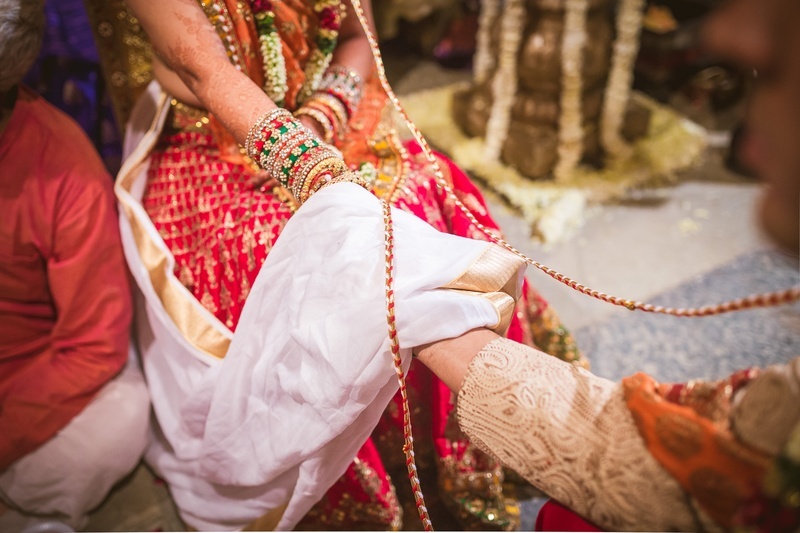 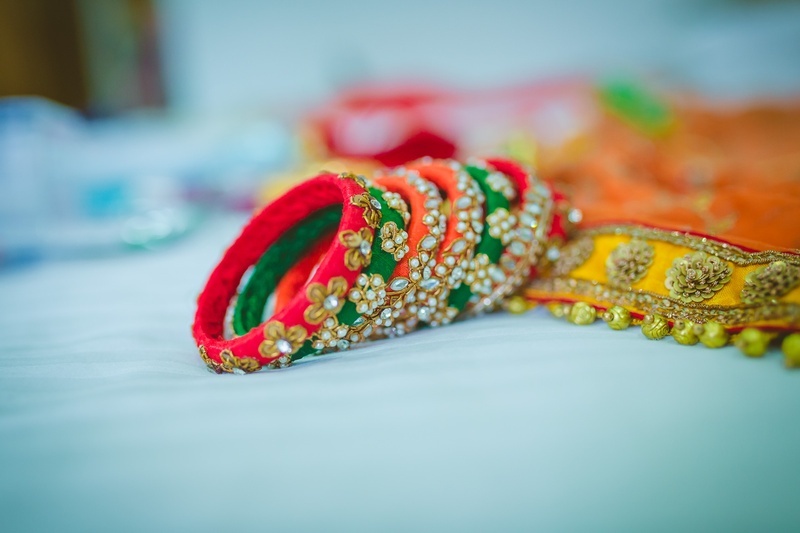 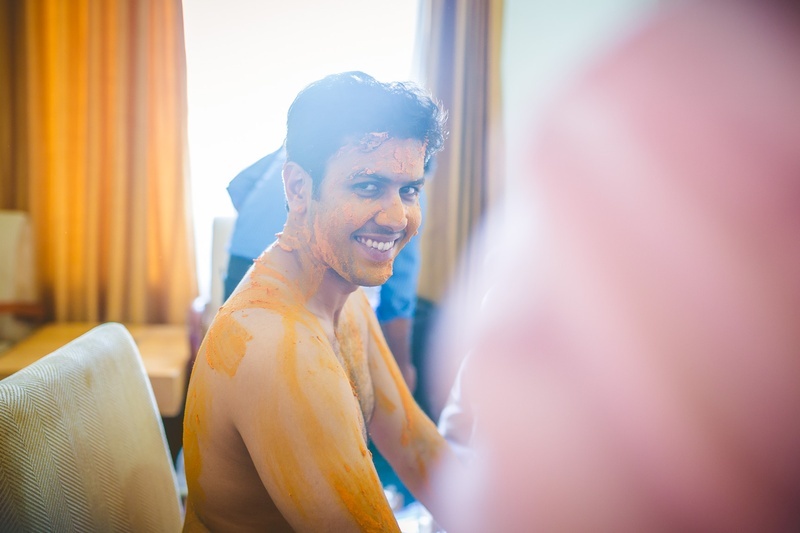 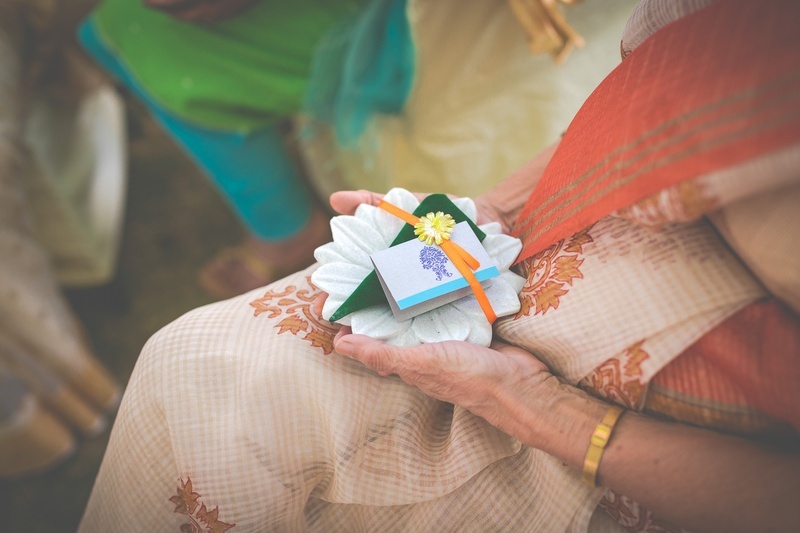 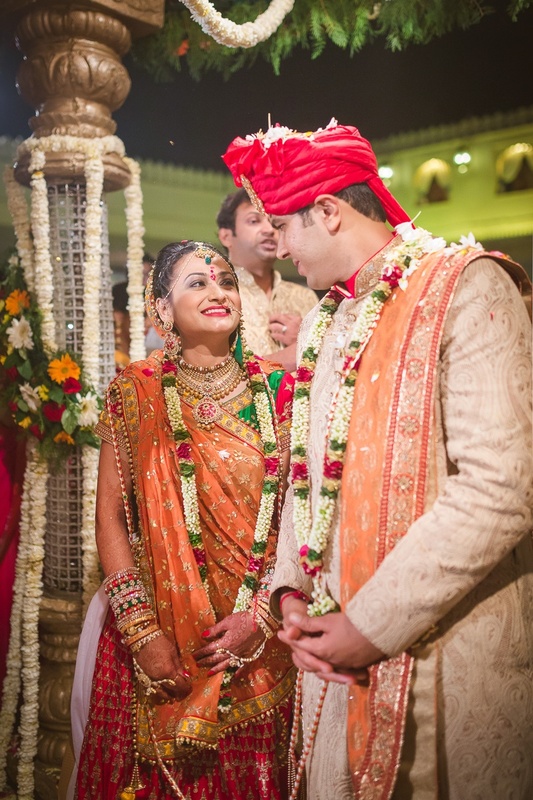 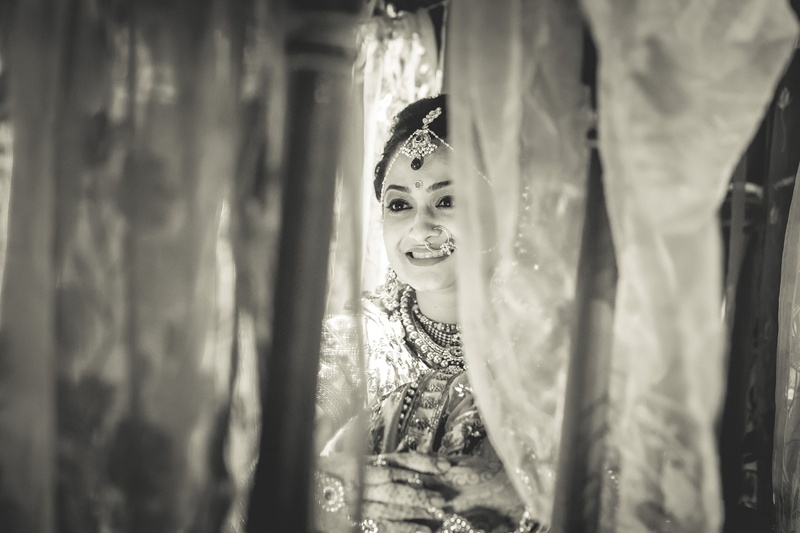 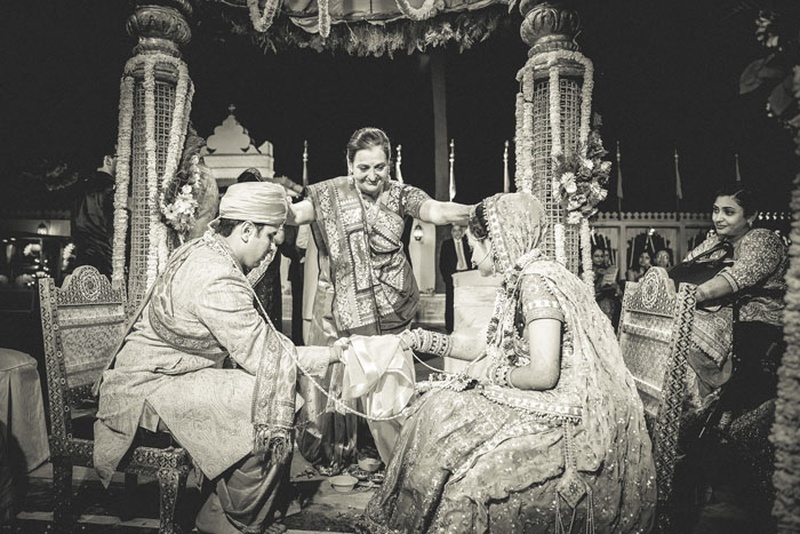 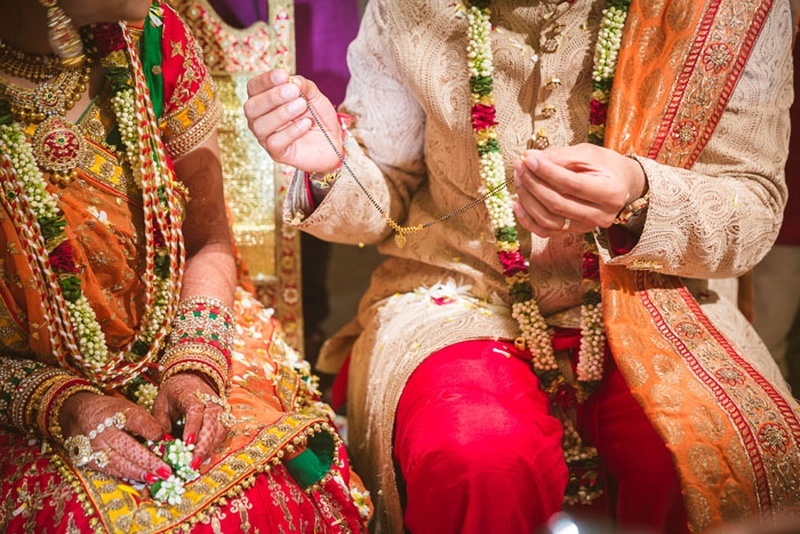 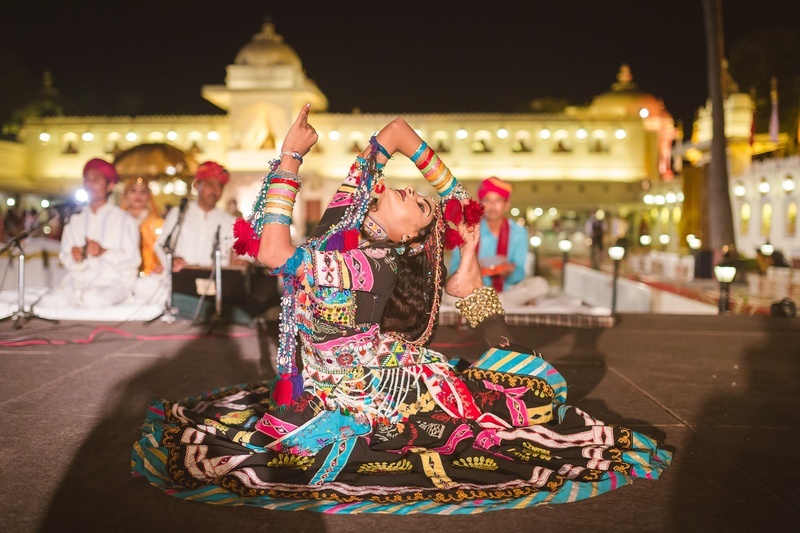 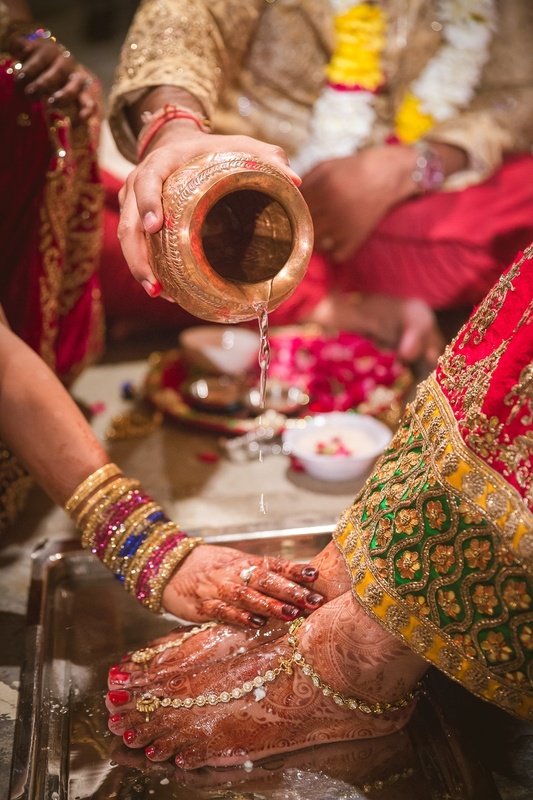 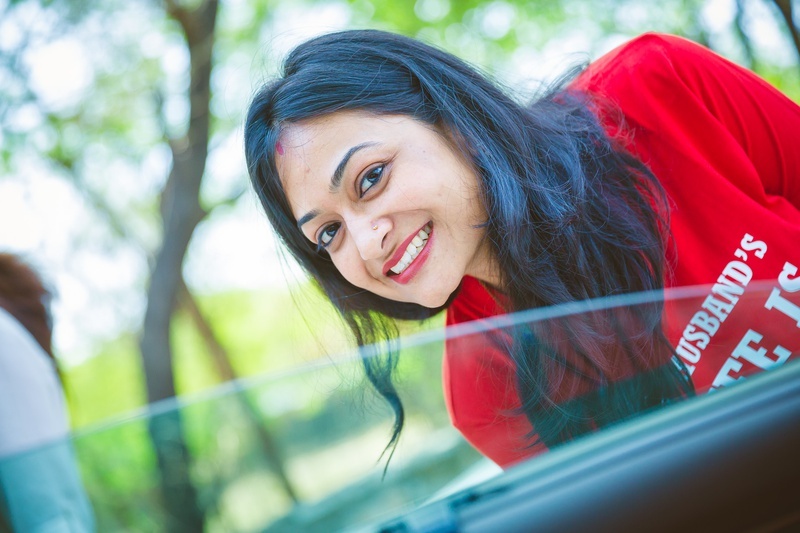 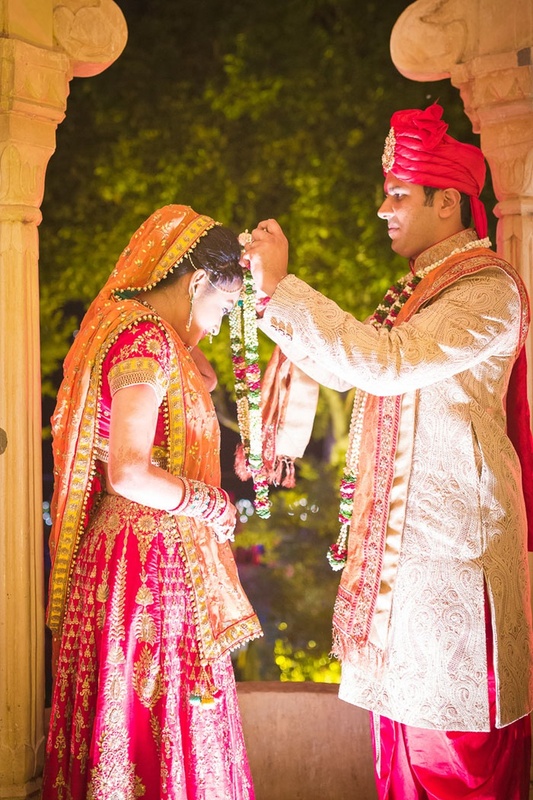 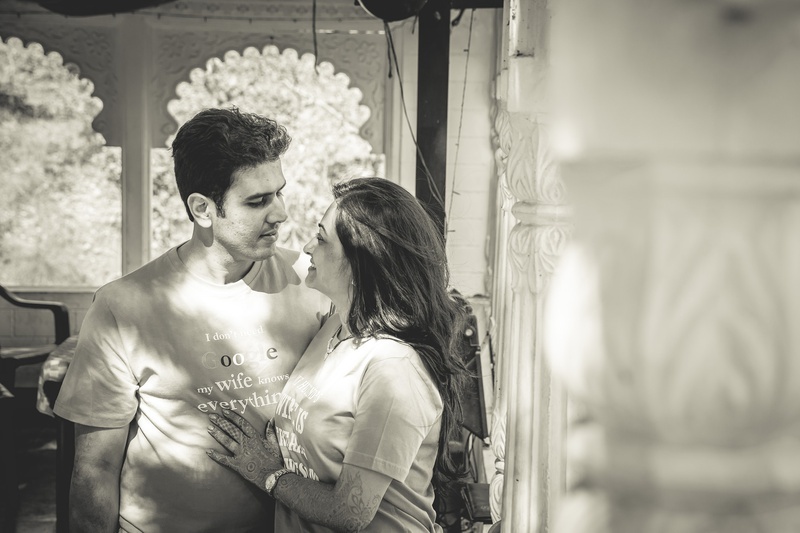 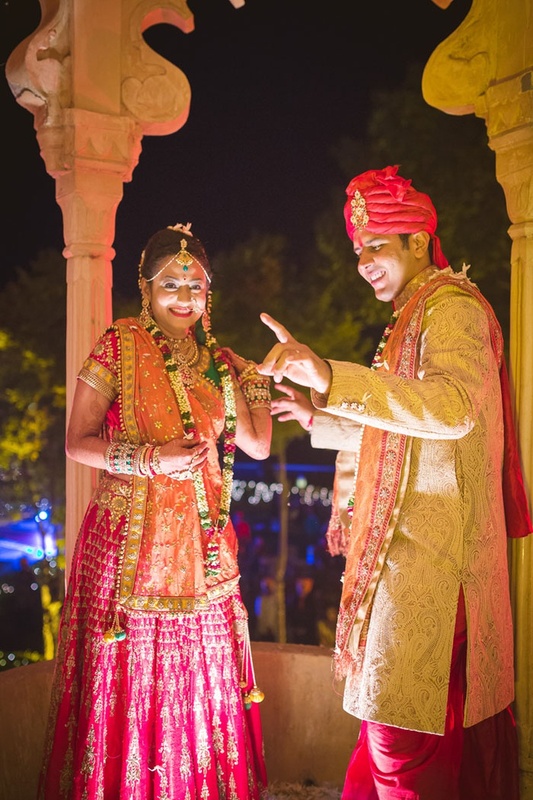 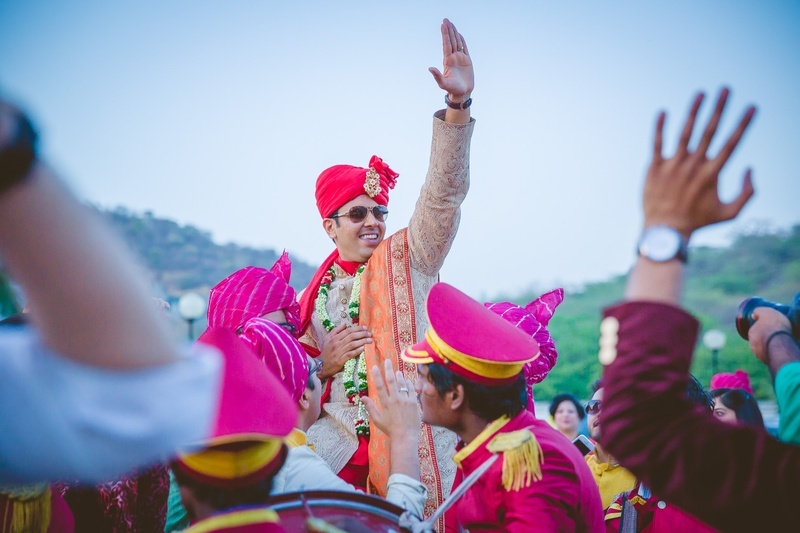 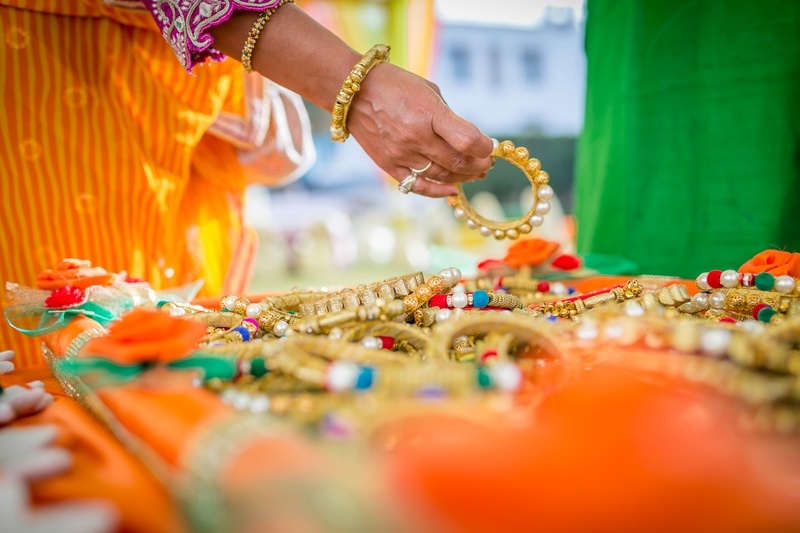 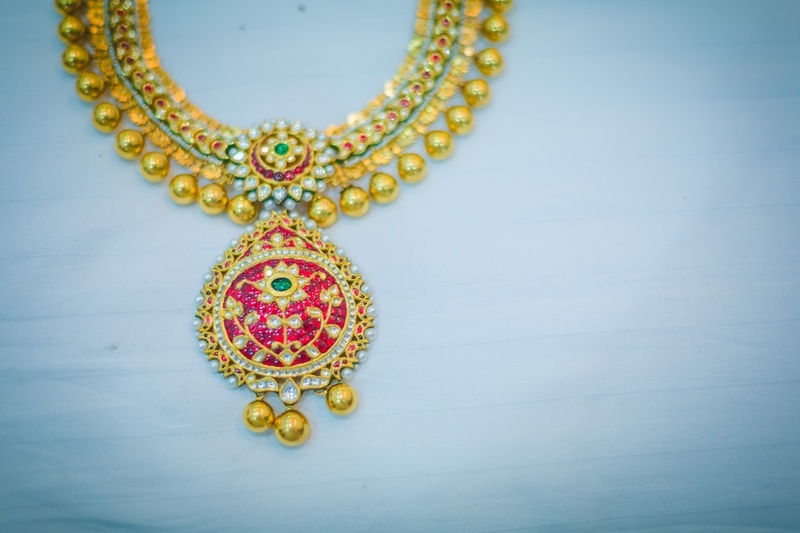 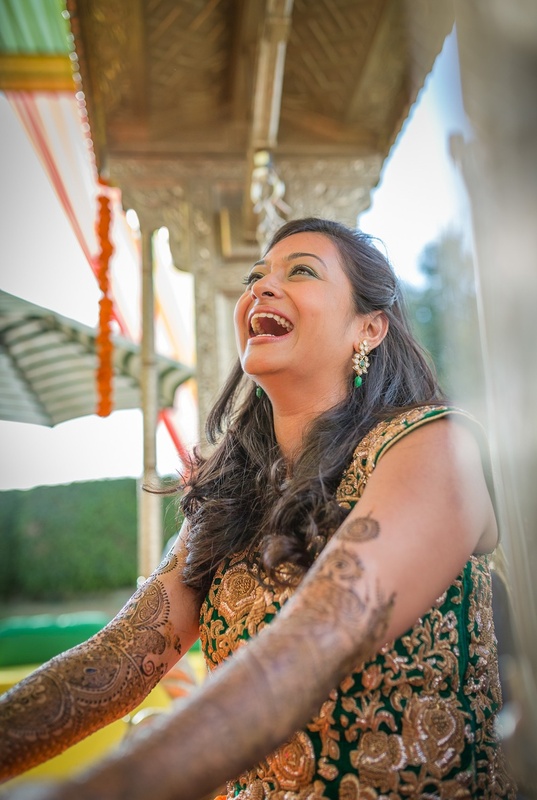 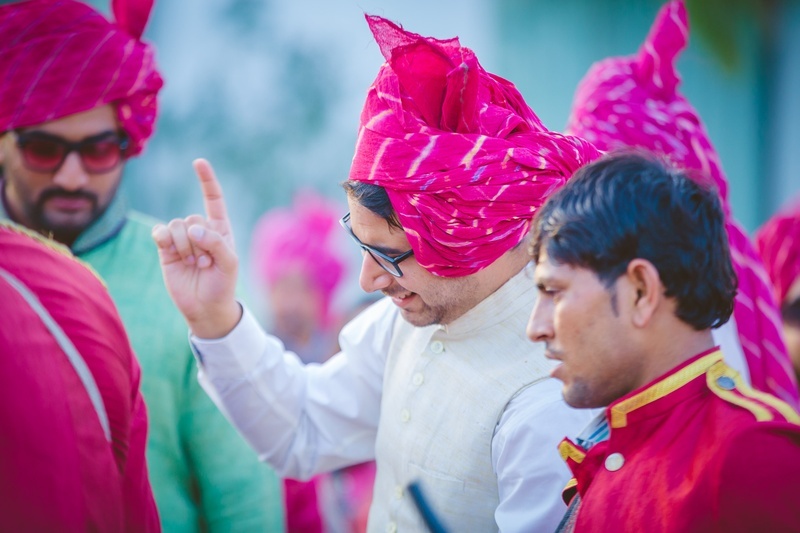 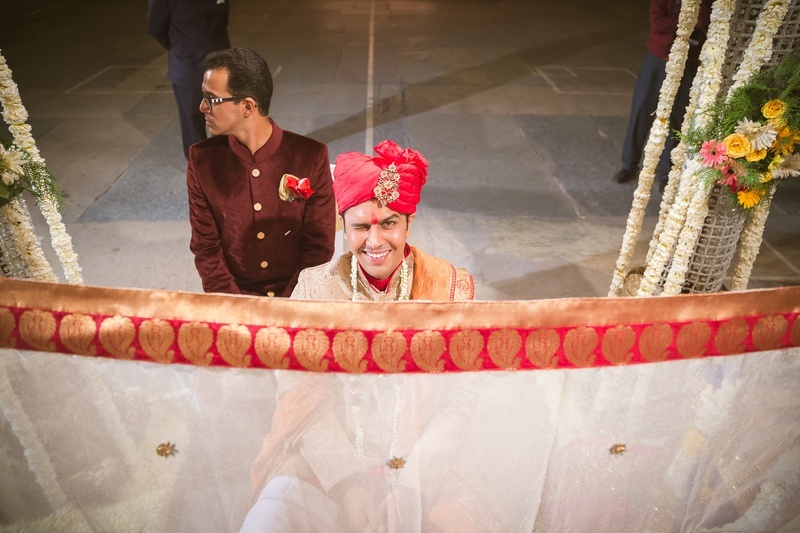 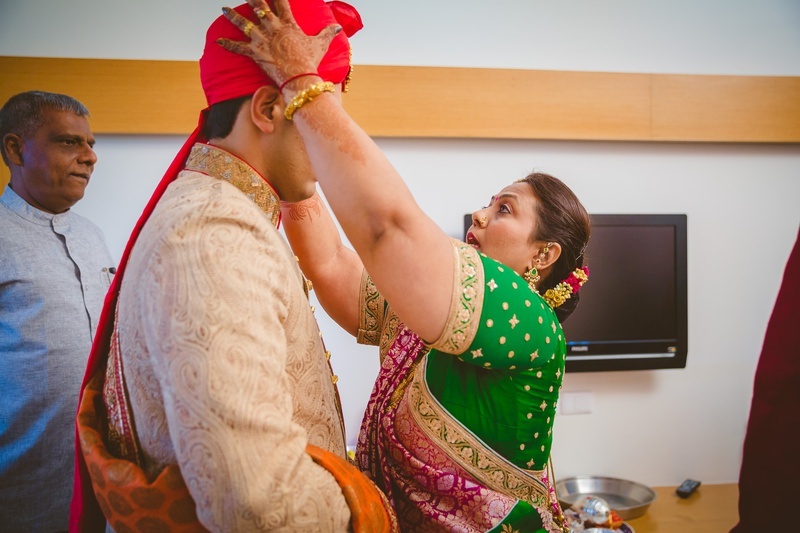 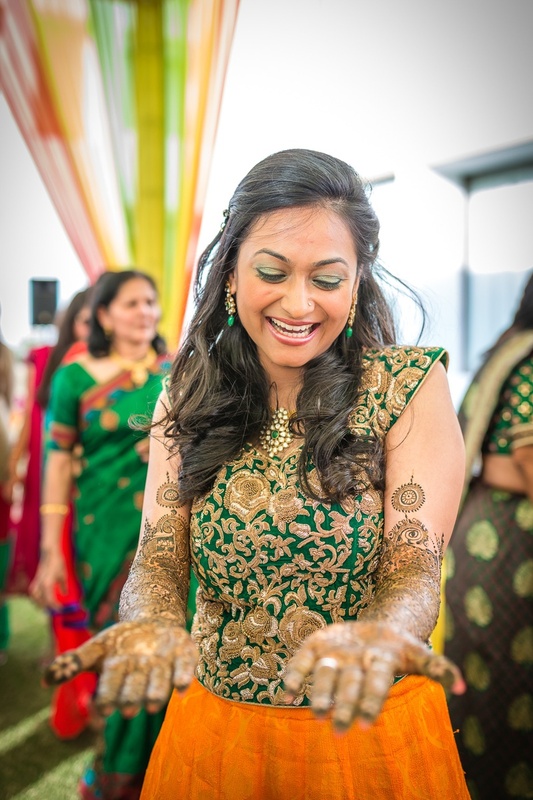 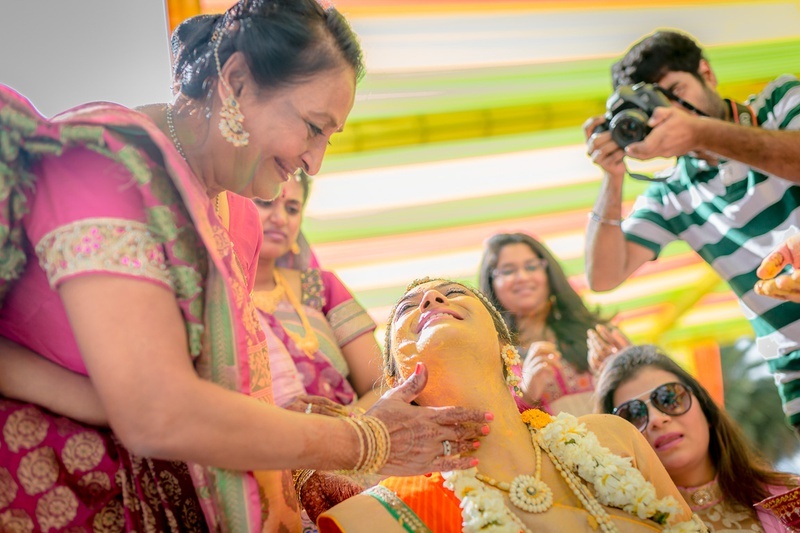 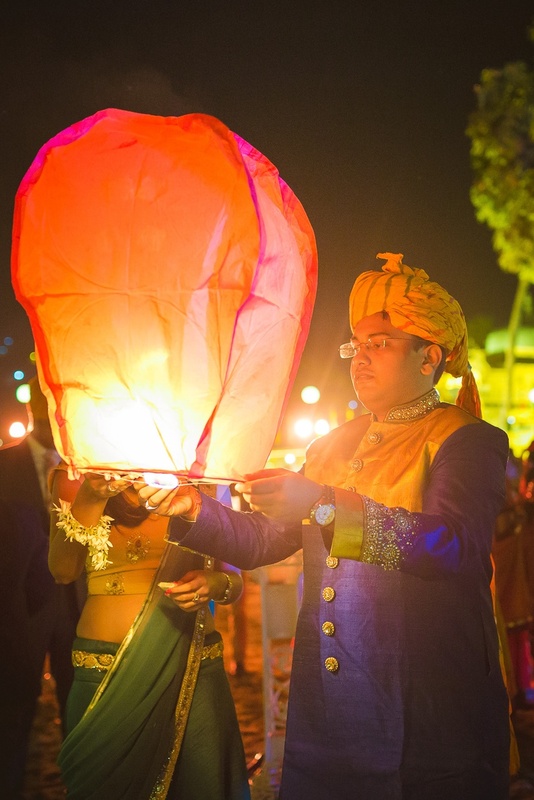 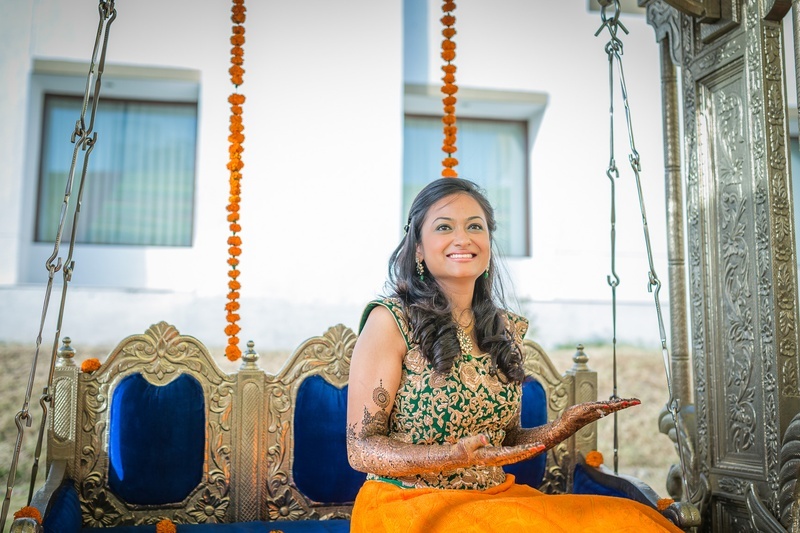 Our favorite elements from this vibrant wedding were the colorful pearl embellished bangles, the groom’s embroidered red jooti’s and the super-fun ‘Together Since’ t-shirts, captured so perfectly by Armour Affairs Photography. 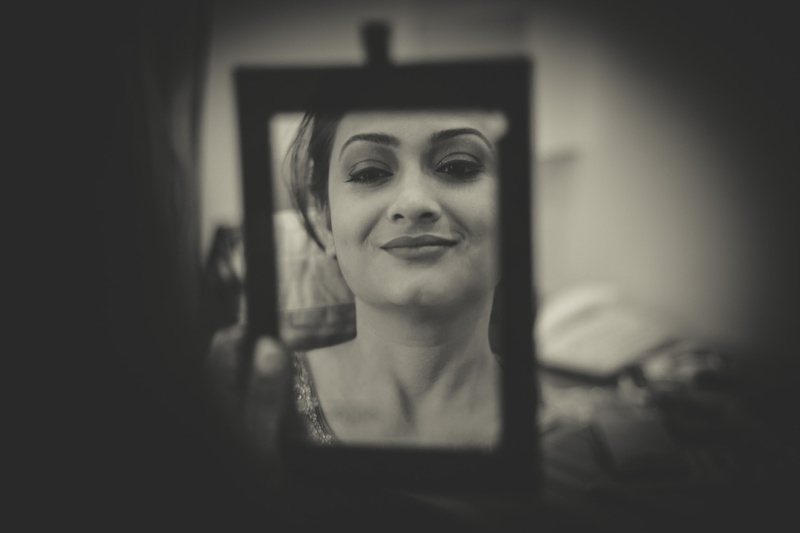 Take a look yourself! 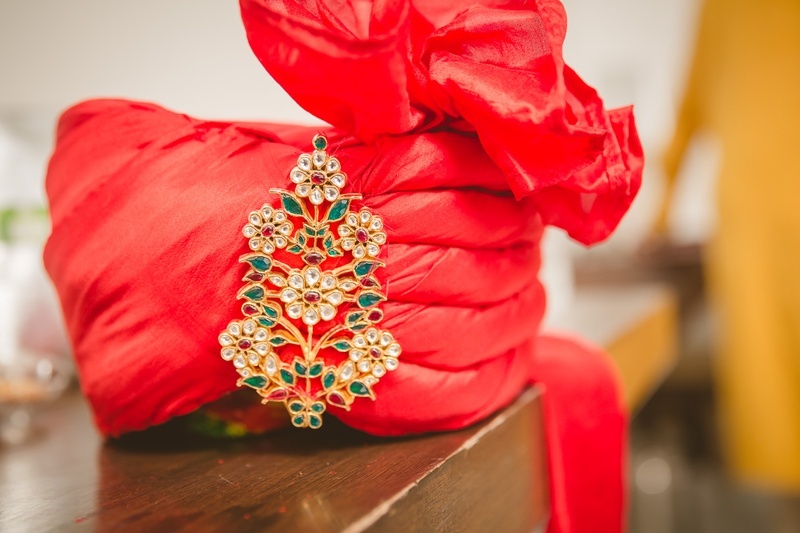 Red embroidered jhuti is a show stealer! 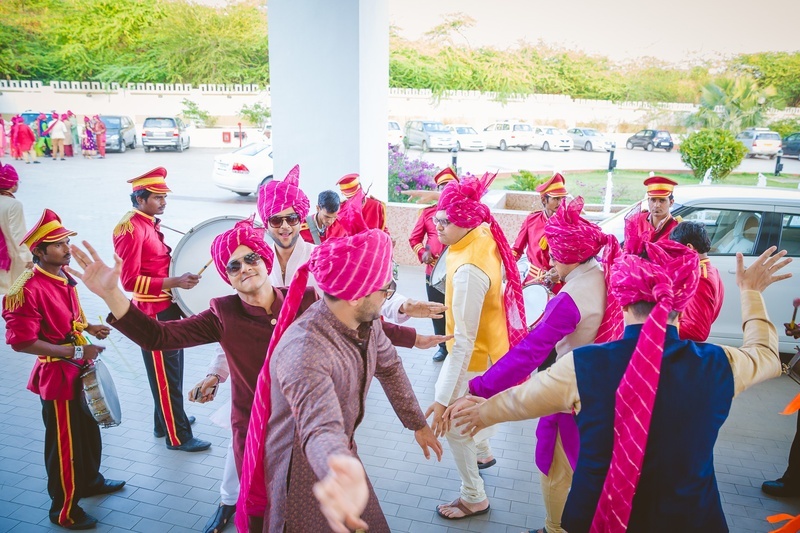 Band + Baaja + Baaratis = Unlimited Joy!